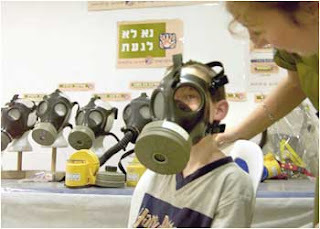 Today we hear that Defence Minister Ehud Barak has decided against distributing gas masks despite intelligence warnings of Syria's stockpiling of bio weapons and its possession of missiles capable of exploding viruses over Israeli cities. Barak feels that this precautionary distribution may be viewed as a hostile act or a preparation for war. And this is the Syria that Mr Olmert plans to make peace with??? That Israel is not prepared for the onslaught being planned by the panoply of Iranian terror proxies was made clear last summer as 25% of the country cowered under a hail of missiles. Now the government announces that it not prepared to make the preparations. Lest they be viewed as a provocation. Since when was self-defence a provocation? And if such a lunatic theory holds water in the sphere of diplomacy, let the citizens have their masks and leave the government geniuses to fend for themselves. My wife returned from Israel yesterday and said she had never seen the place so full of tourists and holidaymakers. There was not a hotel room to be found nor a car available for rental. Long may it last - the country certainly needs all the foreign currency and tax revenues it can get its hands on for the hard times ahead planned by our enemies, to the north, south and - if our nuthead leaders have their way - soon to be well entrenched in the east. But for now there are more pressing concerns. Like getting down to the pooldeck on time to reserve the best seats. Not overpaying for the kids' breakfasts. What to do with the kids tomorrow to keep them entertained. Where to eat? Will we get bumped on the return flight? What excuse can we give the school for getting home 2 days late? As we busy ourselves with these major challenges, spare a thought for our 3 Jewish soldiers who are spending their second summer in captivity. They seem to have been forgotten by a prime minister more concerned with his own political survival than their physical wellbeing. Are they alive? If so, are they in good health? Have they been tortured? In what conditions are they being held? Do they have any hope of being released? And if they are released, will they ever be able to return to the normal life and relationships from which they were snatched? If the truth be told, their plight is not much different from that of Jonathan Pollard, now serving his 22nd year in an American prison. 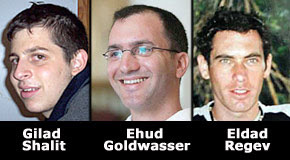 If the prime minister of Israel cannot muster the courage to forcefully demand the release of its man from the prison cell of its closest ally, what hope is there for the release of these 3 men from the custody of our most fanatical enemies? Instead Olmert tells the forlorn relatives that he keeps a photo of their boys on his desk. How touching! Let's hope its not perched too close to the photos of his own sons and daughter who declined to serve in the Israeli army.